Machine wash, medium (except boy's tie). Hat sold on facing page. Cowboy Suit. Reel and black suit. \\"hite snap-on tie. 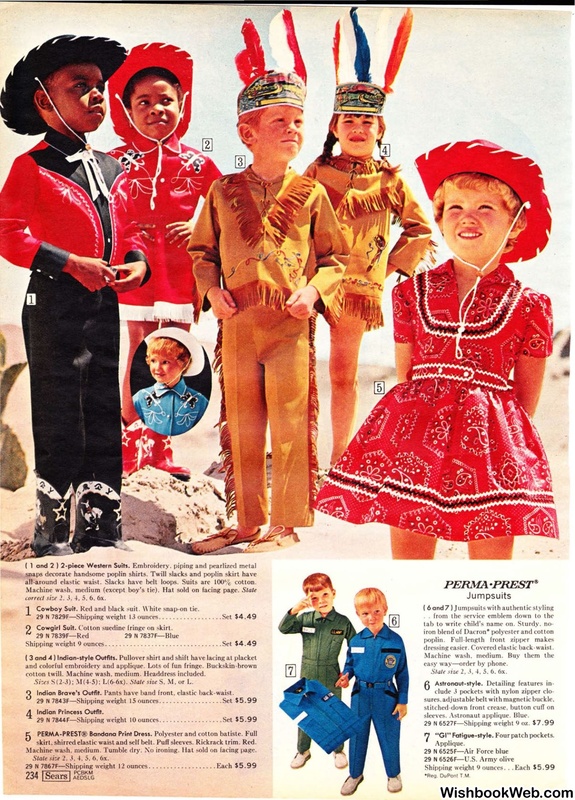 Cowgirl Suit. Cotton suedine fringe on skirt. ounces . .. .. .
cotton twill. Machine wash. medium. Headdress included. Indian Brave's Outfit. Pants have band front. elastic back-waist . 29 N7844f- Shipping weight 10 ounces . . .
skirt, shirred elastic waist and sell belt. Puff sleeves. Rickrack. trim . Red. Machine wash , medium . T umble dry. J:\o ironing. llat sold on facing page. dressing easier. Covered elastic back-waist. "GI" Fatigue-style. Four patch pockets.